LAHORE: (Tuesday, July 24, 2018): Punjab Information Technology Board Chairman Dr Umar Saif has said that E-Rozgar scheme has produced thousands of young entrepreneurs who have earned billions of rupees through online projects. He was addressing the launching ceremony of E-Rozgar Centre at Punjab University at Al Raazi Hall here on Tuesday. 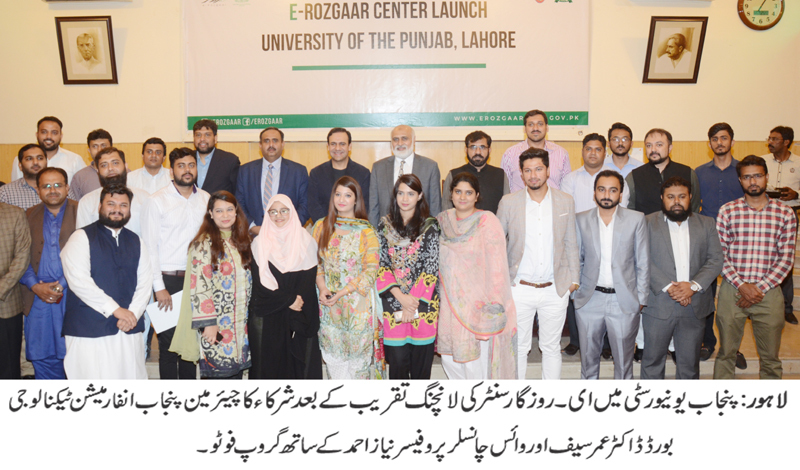 PU Vice Chancellor Prof Niaz Ahmad, PITB Director General E-Governance Mr Sajid Latif, PITB Director Atif Mumtaz, PU Institute of Education and Research Director Prof Dr Rifaqat Ali Akbar, faculty members and a large number of students were present on the occasion. Addressing the ceremony, Dr Umar Saif said that the average age of Pakistanis was 22 years and we had a lot of potential to bring Pakistan among the comity of developed nations. He said that our future was in the hands of youth which was hardworking, intelligent and full of talent. He said that the government also launched Plan9 initiative and now around 160 companies had been established worth Rs 7billion under the project. He urged the youth to become entrepreneur as they could easily earn more than one hundred thousand rupees per month through E-Rozgar. PU Vice Chancellor Prof Niaz Ahmad said that the credit of reducing unemployment in the country went to Dr Umar Saif as he had played his role in this regard. He said that because of his brainchild, thousands of our students were earning billions of rupees and he had promoted entrepreneur culture in Pakistan. He also announced to name IT lab of Institute of Education and Research after Dr Umar Saif.